More details are now emerging of what exactly will go to Ansaldo. It seems that Ansaldo will get PSM, technology for the GT26 and the GT36 (which does not exist yet) including the test facilities at Birr and the LTSA’s for 34 GT26s sold by Alstom. It is good that it is settled but the European Commission has not – in my opinion – got it quite right. The technology seems to be restricted to 50Hz technology (after all, all of Europe is 50Hz). So a current GT26 and its potential upgrades should – theoretically – be available from Ansaldo but not the GT24 (60 Hz). It is the US market (60 Hz) which has access to cheap gas and the 50Hz market will take a while and will be dependant on fracking taking off in Europe. Ansaldo will probably need to take all liabilities to get their first 2 or 3 GT26 engines placed. And even then finding a suitable utility customer to host the machines will pose a challenge. GE will face no competition in the US from an Ansaldo GT24 and probably Ansaldo is not permitted to enter 60 Hz markets except with engines they develop themselves. The development of the GT36 is a long way from being commercialised and the assumption by the EC that this development will be completed by Ansaldo is almost “pie in the sky”. Of course it is theoretically possible! A 60Hz GT34 is even less likely. The EC’s assumption that PSM will be able to service engines like the GE 9FA under Ansaldo ownership is flawed. It is one thing to have an Alstom owned PSM servicing such engines considering that Alstom was the main source of GE 9FA until 2000 (when they acquired the ABB gas turbine business), and quite another to have an Ansaldo owned PSM doing such service. I suspect that GE and Alstom have talked down the difficulties that Ansaldo will face and the EC have bought the sales pitch. Or it could be that the EC does know that this commercialisation of the GT36 (and maybe even the production of the GT26) by Ansaldo will likely not happen, but it gives them a face saving way of approving the GE bid. Money talks. And we need to bear in mind that GE pays only €300 million less which must now presumably come to Alstom from Ansaldo. Just €300 million as the price for the ongoing service business and the assets at the R &D facilities at Birr does not leave much over actually for the technology that has been purchased. does Ansaldo have the additional €500+ million that they will need to get a GT26 into production? And do they have another €2 billion (at least), along with the will and the capability, to bring a commercial GT36 into being?? The commission’s in-depth review, which focused on markets for the sale and servicing of heavy-duty gas turbines operating at 50 Hz, revealed that a GE-Alstom merged entity would have accounted for more than 50% of the European Economic Area market. It was also specifically concerned that the merger would have risked eliminating an important innovator. “The transaction as notified would have reduced customer choice, R&D [research and development] and innovation, with serious risks that certain Alstom heavy duty gas turbine models would be discontinued and that the newly developed and most advanced model (GT 36) would not be commercialised. This was of concern for many market participants, including major European power utilities,” the commission said. The merger was approved on the condition that the parties offered to divest Alstom’s GT 26 and GT 36 turbine technology, existing upgrades and pipeline technology for future upgrades, a large number of Alstom R&D engineers, and two test facilities for the GT 26 and GT 36 turbine models in Birr, Switzerland. The parties will also need to divest long-term servicing agreements for 34 GT 26 turbines recently sold by Alstom, and Alstom’s Power System Manufacturing (PSM) subsidiary. The commission was concerned that if GE absorbed PSM, it would have eliminated competition for the servicing of GE’s mature heavy-duty gas turbines (like its 9FA model) that are installed in existing plants. “As GE is the dominant player in this market and PSM its most significant potential competitor, this would have created a risk of higher prices and less innovation,” it said. 34 gas turbines is a small part of Alstom’s fleet but it may be enough to give Ansaldo a fighting chance of building up experience over – say – 5 years or so. I remain of the opinion that this is a good deal for Alstom and GE. However, I also remain of the opinion that some 8,000 jobs of those being transferred from Alstom to GE or to Ansaldo will be at risk. Ansaldo surely has a chance for becoming one of the “big 4”. But they may have difficulty chewing or swallowing what they have just bitten off. Another thought that occurs to me is that the EC process is itself flawed. The solution (divestment to Ansaldo), which has delayed the deal by a year, smacks more of ego and politics rather than protection of competition. The actual protection of competition achieved is minimal. WSJ: ……. GE already manufactures gas turbines of corresponding size to the two Alstom models, and the company says it will retain licenses that will enable it to compete for business servicing turbines made by other manufacturers—an opportunity for future earnings growth. The U.S. company will also divest the long-term servicing contracts for 34 turbines that have already been installed by Alstom. GE has said that Alstom’s servicing contracts were a key attraction of the deal, but a person close to the deal said the divested contracts amounted to only 4% of Alstom’s total installed base. “I am glad that we can approve this transaction, which shows that Europe is open for business and that Europe-based technology can thrive and attract foreign investment,” Ms. Vestager said. Well, the European Commission has given GE approval for the acquisition of Alstom’s power and grid businesses. But Ansaldo will now get Alstom’s large GT technology (it’s not clear to what extent), the testing facilities in Birr and some substantial service business. Whether Ansaldo actually gets the GT24 and GT 26 engines or just technology is not clear yet. As part of GE’s offer, Ansaldo will acquire Alstom’s technology for large and very large gas turbines. Alstom will also cede two test facilities for these turbine models in Birr, Switzerland, the EU said. “Ansaldo will have a true fighting chance” of competing in the European market, Margrethe Vestager, the EU’s competition commissioner, told reporters in Strasbourg, France. The Italian firm should gain a foothold in the maintenance business by taking over long-term contracts Alstom holds to service 34 previously-sold gas turbines, the commission said. Ansaldo will also acquire Alstom’s Power Systems Manufacturing unit which can service gas turbines of different makes, the regulator said. With PSM going to Ansaldo, Shanghai (via PSM) gets a foothold in the US for 3rd party engine service – for whatever that may be worth. But I am not very hopeful. As an owner, I would not be very keen on asking an Ansaldo owned PSM to service a Siemens or a GE engine or even an old Westinghouse engine. Good luck to Ansaldo anyway. It will be interesting to see if Shanghai Electric can provide sufficient influence to make this work. Ansaldo on its own would have very little chance to make it, I think. It will still take them the best part of a decade and by then GE, Siemens and Mitsubishi would have moved on. I think the EC’s competition commissioner is fooling herself more than a little when she states that “Ansaldo will have a true fighting chance”. She is being far too optimistic, but maybe Shanghai can make the difference. The Ec’s conditions does not have a great impact on the jobs that will be lost. This will stay at around 8,000 I think for GE. Of the jobs shifted to Ansaldo, I am not very optimistic. A pity, because I think this marks the end of sequential combustion with a viable player. I wouldn’t mind being proved wrong – but the probability is rather low. But it’s good news for both Alstom and GE. For Ansaldo, it may be too much of a mouthful. Reuters reports “exclusively” – and no doubt from anonymous EU bureaucrats as their sources – that the EC is set to approve the GE/ Alstom deal. The EC decision will be announced by 11th September. The report suggests that GE was prepared to accept the divestment of PSM and of a “facility” in Switzerland. That probably consists of some or all of the gas turbine R & D operations at Baden/Birr. The precise scope of the GE concessions are not yet revealed. The French government, is probably not too perturbed by what happens to Swiss jobs or to PSM jobs in the US. And the price to be paid by Ansaldo probably compensates for most of the reduction that Alstom has accepted in the price to be paid by GE. In fact Alstom, the French government and Bouygues are all probably quite relieved to now see their way clear to financial closure. Alstom management will also be quite glad to get rid of the difficult task of controlling “fortress” Baden. Whether GE for part, and the Italians or the Chinese for the rest, are up to that task is another matter. Ansaldo (with Shanghai Electric) has emerged as the unlikely saviour of the gas turbine R & D tradition at Baden/Birr in Switzerland. But whether under GE ownership or in some hive-off to Ansaldo, it is only logical that many jobs in Switzerland would shift either to France or to Italy. One estimate puts the job losses to be expected in Baden to be around 600. I would expect the number to be very much larger. As far as the European Commision is concerned they may be making the calculation that more jobs will shift to Italy with Ansaldo ownership than would have shifted to France under GE ownership. Job losses in Switzerland, of course, will not weigh very heavy with the EC in any case, and especially not if they were to shift to France or Italy. The EC may be calculating that Ansaldo could manage and run an R & D facility at Baden. I am not very optimistic about Ansaldo’s ability to be a technology owner. Shanghai Electric is more credible for that. My personal opinion is that Ansaldo has not the management strength or the R & D traditions to be able to manage an R&D program in Switzerland. (I note that even after a wholesale influx of French personnel, Alstom had its difficulties to manage Baden). On the other hand, any jobs which shift from the long and rich R & D traditions of Baden to Genoa will effectively be R & D which comes to an end. If the focus of development of an “Ansaldo” sequential combustion engine shifts to Italy, I would go so far as to forecast that it will never happen. If this focus shifts to Shanghai instead, it will take a very long time but the development will eventually happen. With Shanghai Electric providing the “deep pockets” for Ansaldo, I suspect that jobs shifting to Italy will only be as a stop along the way to China. General Electric wants the energy division of Alstom.This could have a major impact on the Swiss workforce. Unions say that up to ten percent of the people have to go. ……. According to reports, GE will therefore sell its gas turbine business – the heart of Alstom Switzerland. The buyer would be the publicly listed energy company Ansaldo, a subsidiary of the Italian industrial group Finmeccanica. “Ansaldo is expected to shift the business to Genoa,” says a trade unionist. ………… On 11 September, the Commission will announce a decision. “The closing of the deal in the second half of 2015 remains our goal,” said GE spokesman Bernd Eitel. For the EC, sacrificing Swiss jobs ostensibly for the benefit of any EU country is probably positive. But what about sacrificing Swiss jobs and an R & D tradition for the benefit of Shanghai? Disclaimer: I should note that I own a few shares in GE and in Alstom but not enough to influence even my own opinions. I own no shares in “Baden” but I have a huge respect and admiration for the R & D work done at Baden as BBC and then as ABB and even later under Alstom ownership. Baden has been less impressive as a role-model for good management practice. US-based General Electric (GE) has confirmed it is prepared to sell parts of Alstom’s gas turbine assets to Italian Ansaldo Energia in order to gain European Union approval for the proposed $17bn acquisition of Alstom’s power business. Sources have been quoted by Bloomberg as saying that GE informed the EU that it is willing to divest some of Alstom’s sale and servicing activities to the Italian firm, along with certain intellectual property. Alstom has also agreed to lower the prices of its energy assets to support GE’s efforts to win anti-trust clearance from the European authorities. Even with Shanghai Electric’s deep pockets I don’t see that Ansaldo could come out with a sequential combustion engine in less than 5 years and perhaps not for a decade. Ansaldo does not have a tradition of breakthrough innovation and neither does Shanghai Electric. The current Ansaldo engines could not be easily modified to cater for sequential combustion. They would have to come out with a completely new machine. More importantly they would need new compressors for the higher pressure ratio that sequential combustion demands. And I don’t see either Ansaldo or Shanghai Electric developing – or even having the capability to develop – a brand new compressor anytime soon. However if the EC’s requirements are seen as helping the Chinese (via Ansaldo) gaining a clear foothold in Europe, the EC will not be very popular in France or even with Siemens. In fact this is the argument being used by the French government to urge the EC to approve the deal quickly. a divestment of some of Alstom’s service business and this could be either by a divestment of a small part (not more than 10 installed engines in my estimation) of the service business for Alstom’s GT26 (probably not GT24) fleet, or by a complete or partial divestment of Alstom’s service business for non-Alstom machines. Whatever actually transpires, the heavy duty gas turbine playing field is seeing upheavals of a kind not seen since ABB divested to Alstom in 2000. With a GT market cycle of 7-8 years, that was two market cycles ago. The next 2 decades (3 market cycles) will probably be dominated by an era of relatively low gas prices. A gas glut and a gas turbine boom could well see the market grow such that entry barriers are reduced and we may see some new players being able to break in. The “remedies ” that GE has proposed to the European Commission to meet the EC’s concerns about their acquisition of Alstom’s power and grid businesses have not been disclosed. Now it has been announced that the Alstom Board has approved a reduction of €300 million in the sale price to GE. Since I suspect that GE’s proposed “remedies” are in two main areas (technology and service business), it would seem that the €300 million is made up of Alstom retaining some “balance sheet items” and some profitable business that will not, now, be transferred to GE. Alstom shareholders will be looking at the numbers. 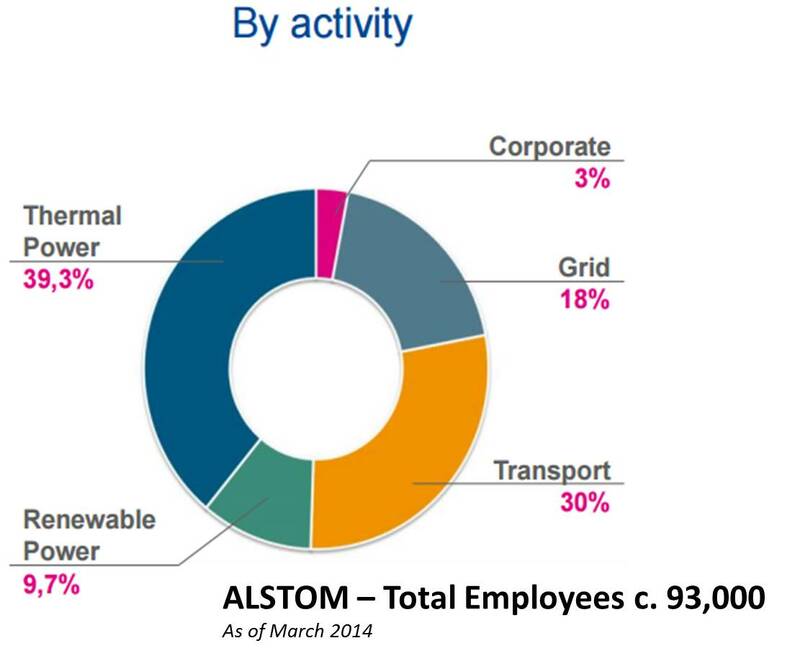 Alstom has 309,419,350 shares with a nominal value of €7 each, giving a paid up share-capital of €2.165 billion. The current market cap is €8.22 billion with a share price of €26.6. The original deal with GE was for a sale price of €12.35 billion (€39.9 per share). This has now been reduced by just under €1 per share. Since the deal was originally announced Alstom agreed to pay a fine of €695.4 million ($772 million) to the US to settle past bribery charges. GE had also agreed to pay Alstom an additional €400 million for further, unspecified, commercial arrangements. Since the announcement of the deal therefore the Alstom shareholders have taken a net hit of €595 million (-695+400-300) or €1.9 per share. Estimates of what could finally be received by the shareholders varies between €3.2 and € 3.7 billion ( c. €10-12 per share). Just as a number crunching exercise I assume that the €300 million reduction is made up of – say – €150 million of balance sheet items (assets to be retained by Alstom) and €150 million is for ongoing business (with a profit potential of about €15 million per year) which will remain in Alstom’s hands. If some of the assets to be retained are IP then their “value” will probably have to be written off by Alstom (as “goodwill”?). Whether Alstom can sell such IP to any other buyer (Shanghai/Ansaldo?, Doosan?) is doubtful but could be a little bonus for shareholders if it does transpire. If some real assets are retained, then presumably they could still generate some profit for Alstom. It occurs to me that a “smart” way out for GE could be with Alstom retaining PSM (Power Systems Mfg., LLC.) a wholly owned subsidiary. This unit is Alstom’s “pirate” company for performing service on non-Alstom machines. This might kill 2 birds with one stone. In 2000 Alstom lost its GE licence and acquired ABB’s gas turbine business. PSM was formed in 2000(?) and acquired by Alstom in 2007. As a “pirate” it is involved with the service of GE Frame 6B, 7E/EA, 9E and 7FA machines, the Siemens/Westinghouse 501F (SGT6-5000F) engine and the Mitsubishi 501F engine. The loss of competition in the service business is one of the particular areas of concern for the EC. Moreover, GE does not really need PSM. It could well be that Alstom retaining PSM may provide the necessary concession regarding competition in the service business and the entire business may well have a value as an ongoing business of €150-200 million. Such a solution would mean a much smaller hit for the Alstom shareholders since Alstom could probably continue with the this very self-contained business especially since it is not concerned with the Alstom range of Heavy Duty Gas Turbines. The profitability of this continuing business should not be much impaired by remaining in Alstom ownership. PSM should be “saleable” and could be quite attractive to an aspiring player. Of course this is speculation, but perhaps Alstom shareholders need not be too despondent over the latest Alstom concession of €300 million. If most of that is due to the retention of PSM then the value of that ongoing and profitable business will not be lost. Previous posts on the GE/ Alstom deal. I speculated a few days ago that the remedies that GE had submitted to meet the European Commission’s concerns for this deal could well succeed. I also speculated that GE would have addressed concerns in two main areas; gas turbine technology and the business of servicing the Alstom fleet of gas turbines. The EC decision is not due till late August but I observe that there has been a surge in speculative reports about a likely approval. These are appearing in the business and in the trade press and my guess is that they must be based on some background, unattributable discussions not only with Alstom and GE officials but also with officials of the EC. It does seem that a conditional approval will come in August and with the time needed for implementing the proposed remedies, financial closure could come early in 2016, Q1. Financial closure by the end of 2015 would be a little optimistic. After a closed door meeting on 2nd July with the EC to explore the EC’s concerns over its acquisition of Alstom’s power and grid business, GE was given till 16th July to make a written submission of any modifications to the deal. The EC decision is expected by the 3rd week of August. So as not to block potential – and qualified – competitors from entering the HDGT market, GE may have offered to make “open source” that technology and IP from Alstom which they do not use themselves. This could, for example, be done by making specified patents and associated test and operational results “freely” available though, perhaps, subject to some nominal royalties. These concessions may satisfy the EC’s concern that the number of OEM’s for HDGT’s would decrease such that there would be an unhealthy concentration of market share. So as to ensure that pricing for the servicing and for spare parts for Alstom’s fleet of engines would not be unduly or unfairly increased, GE could have offered to limit some margins on this business. They could, for example, hold or index prices for spare parts to 3rd party service providers in – say – Europe for machines installed prior to – say – the year 2000. I suspect that GE would have found a creative way to ensure that their business plan revenue from the service business was maintained with concessions to the EC only on margins rather than on revenue. This should bridge much of the gap, since the EC is primarily looking to avoid monopoly or predatory pricing and unjustifiable margins. I expect that EC approval for the deal is now very close. Perhaps one more iteration will do the trick. Of course I am only speculating and I personally would like to see the deal go through. The European Commission must make its decision by early August regarding GE’s proposed acquisition of Alstom’s energy and grid business. The EC’s concerns have held this deal up for the best part of a year. I estimate that financial closure for this deal is now no longer possible at least till the end of 2015. The EC sent GE its “statement of objections” in the middle of June. This week (tomorrow) GE will be attending “hearings” at the EC at its own request. The hearings are to be “oral” and the meetings are “closed-door”. It seems to me that this is more of a negotiation rather than a “formal” hearing. Clearly GE will be exploring how far it needs to go in its final, written submissions which will be needed before the EC can make any formal adjudication in August. I suspect that GE might be considering “creative” alternatives for making IP from Alstom, which it judges it does not – and will not – need, available to other “serious” players. One difficulty is that a lot of IP has value in creating a barrier for others, rather than being usable in its own right. I also suspect that GE is looking to ensure that the revenue stream from the service of Alstom’s fleet of operating gas turbines is not impaired by being forced to give up part of that business. And to do that GE may be considering ways and means of assuring the EC that the pricing of such service business will be “reasonable” and not predatory. Personally I think that many of the EC’s fears are imaginary or theoretical. They are quite insignificant compared to some of the predatory pricing and price-fixing that is evident in other industries. But then my own opinion is that it is better not to have a competitor in the market place rather than for a “sick” or reluctant competitor to be forced to continue. That only encourages distortion of the market place to the ultimate detriment of OEM’s and customers and eventually consumers. Moreover, R & D for advanced gas turbine technology will, I think, be served best by the deal going through. According to Reuters, General Electric, the EC, other EU agencies, and parties opposing the deal will take part in a closed door hearing this Thursday, July 2. Senior officials from the EU competition authority, their counterparts from EU agencies and rivals are expected to attend the closed-door hearing. “We have requested an oral hearing,” GE spokesman Jim Healy said. He said the hearing would be on July 2. French Economy Minister Emmanuel Macron has said the deal should be viewed in a global perspective and take into account Chinese rivals following the EU regulator’s decision to exclude the Chinese market from its scrutiny of GE’s market power. The Commission is concerned the takeover would leave just two gas turbine companies in Europe, with GE competing only with Germany’s Siemens. The EC has not announced who the objectors are but I expect that Ansaldo Energia (40% owned by Shanghai Electric) and Siemens are among those opposing. I can well see that Ansaldo/Shanghai would be looking to be able to access some of Alstom’s IP to help them to bridge the not inconsiderable technology gap they must overcome to even have a chance of becoming a major player in the Heavy Duty Gas Turbine market. Siemens, I am sure, would object as a matter of principle even if they will actually benefit from the deal. I am not sure if Mitsubishi-Hitachi has a presence large enough to have any locus standi as an objector in Europe. The Siemens/Wood Group JV (Turbo Care) which focuses on the service of non-Siemens gas turbines is likely to be a principle objector but in this case it is essentially a “pirate” and, hopefully, will not be given too much credence. Patrick Kron, CEO of Alstom is very bullish – but then, of course, he can hardly be anything else. Bidnessetc: Alstom SA chief executive Patrick Kron remains bullish that General Electric Company will successfully acquire its energy unit and will also have the European Union (EU) regulatory authorities’ approval. Mr. Kron’s statement came as General Electric has requested the EU antitrust authorities to conduct a hearing with the aim to get their approval. WSJ: The European Commission, the EU’s top antitrust regulator, said it had sent a so-called statement of objections to the U.S. industrial company on Friday. The EC are playing hardball and seem to be looking for substantial concessions from GE before approving GE’s acquisition of Alstom’s power and grid businesses. According to Reuters a statement of their objections could come today (12th June). Reuters: General Electric Co may need to offer bigger concessions to win European Union approval for its purchase of Alstom SA’s power unit as regulators plan to warn the U.S. company that the deal would harm competition, two people familiar with the matter said on Thursday. ….. “A statement of objections could come on Friday,” one source said. Such a document shows why the EU regulator views the deal as anti-competitive and is a prelude to a veto unless companies come up with strong arguments or significant concessions. Alstom shares fell 3.2 percent following the Reuters story, while GE was down 0.3 percent. An EC spokesman declined to comment. Alstom had no immediate comment. GE said it was working constructively with the regulator. “We are focused on a positive outcome that preserves the deal economics,” GE said, adding it was confident of closing the transaction in the second half of 2015. As I have written before, I expect that the EC objections are centred around what will happen with Alstom’s Heavy Duty Gas Turbine (HDGT) technology and service business. GE has no immediate need for Alstom’s sequential combustion technology, though, in the long run, GE may be the best placed to utilise that technology to take gas turbines to new heights. Regarding the service business for gas turbines it is very rarely, and only for older machines, that a party other than the OEM can provide the most critical spares. So such spares for the Alstom machines would come in the future from GE instead of Alstom but it would be no real change to the competitive position. (For the critical, “noble” parts of any not-too-old gas turbine, the OEM has a virtual monopoly). None of these options would be easy to implement. Option 1, I think, will not fly. Option 4 is probably beyond GE’s walk-away point since the heart of their business plan – the service revenues – would be impaired. Some variation of Options 2 and or 3 and parts of 4 maybe will not chase GE away. The EC is due to announce its decision by early August, and since the EC is in regular discussions with GE, it does look like there is a negotiation ongoing (even if it cannot ever be acknowledged to be a negotiation by either party). I suspect Alstom has no great part to play in this negotiation. The French government probably can not be seen to be involved, but they are certainly not happy with the EC and its objections. (Of course, it is inconceivable for the French government that the EC could possibly go against “French interests”). The statement of the EC’s objections – if it comes out today – should give a good indication whether this deal is going to go through or will eventually die. But killing the deal is not really in Europe’s interests, so the EC will have to tread very carefully.